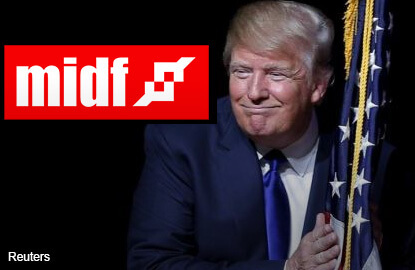 KUALA LUMPUR (Jan 24): U.S. President Donald Trump’s next move and decisions on trade policy will be crucial to the direction and future of global trade and economic activities, said MIDF Research. In an economic brief today, MIDF Research highlighted the next thing to observe seeing that Trump has withdrawn the U.S. from the Trans-Pacific Partnership (TPP) trade deal, is whether he would decide to impose higher tariff for China-made products. “As we have been expecting, Trump actually did officially withdraw U.S. from the TPP. It was one of the keystone in his manifesto and will have minimal cost to his administration,” MIDF Research said. “The next one will be on North American Free Trade Agreement (NAFTA), where he has mentioned that he will renegotiate the terms for the best of U.S. interest,” it added. U.S.’ retreat from the TPP now means the gap between it and its Asian counterparts are further widened, with China spreading its influence further in the region. “In the meantime, while U.S. has been heading towards protectionism policy, China is looking forward towards new regional trade deals, particularly in the latest speech by President Xi Jinping at the recent World Economic Forum,” MIDF Research said. “Although different in direction, both countries are heading towards the same objective including widening their trade balance — more exports, less imports. The next thing to observe is whether Trump will actually decide to impose high tariff for China’s products and how will China retaliate, if that actually happen,” it added. Trump reportedly said he will also begin negotiating with Canadian Prime Minister Justin Trudeau and Mexican President Enrique Peña Nieto, with regards to the NAFTA. NAFTA is a 23-year old trade pact between the U.S., Mexico and Canada, which abolished all tariffs between all three.